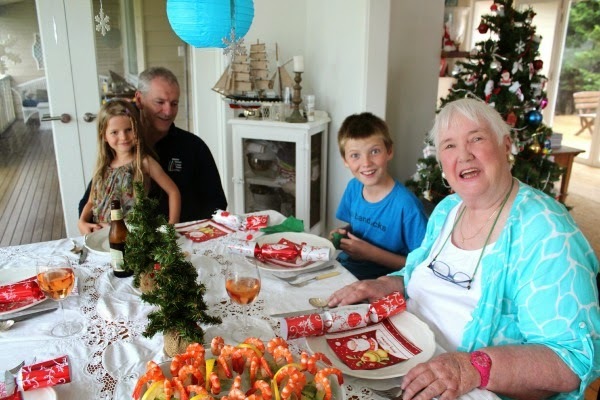 Our Christmas 2014 seemed to have come and gone very quickly this year. Perhaps because of the significant birthday party distractions for Mr Beach House, or as a consequence of the Sydney cafe siege. 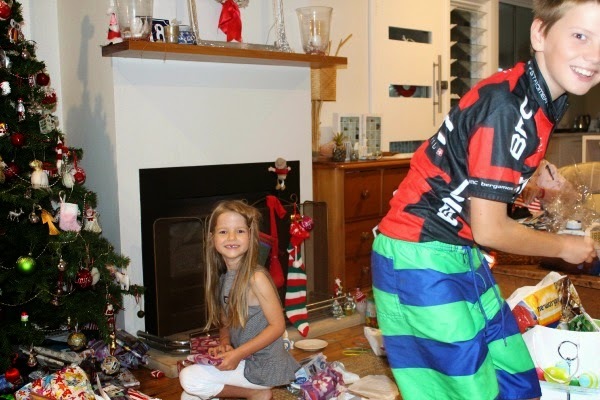 Either way, it didn't feel much like Christmas, but I went through the motions as a mother must always do and that seemed to work, as it turned out to be very enjoyable Christmas, even if it was a bit of a blur. 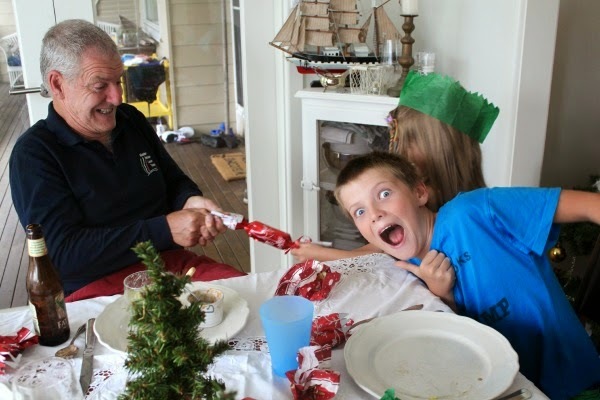 We also had to jump in the car at 6am on Boxing Day, to beat down to Melbourne, to make it in time for embarkation on the Spirit of Tasmania, to cross Bass Strait that night. The family had a National Championships sailing regatta to compete in, which ended up being a very successful campaign. They had a podium finish, with a second place result. But more importantly, we now have the defending national champion in the talent quest in the family. The talent quest is an annual feature on the social calendar of the regatta. Madam decided she would sing 'Let It Go' to Olaf with a mic, but without music and blow me down, she won it. She has a sweet voice for a 6 year old and she has a shedload of guts to get up and pump out a ballad, in front of 60 people. I think the cuteness factor helped in her win. Next years regatta is at Port Lincoln in South Australia and Mr Beach House jokingly said "Well we have to go to South Australia now, so she can defend her title". I am not convinced we will do that, but I do know one thing is for sure. I will be creating and cooking more food next Christmas. One thing that is important to me about the holiday season, is the food. There's always way too much of it, but it is fabulous. And it's the one time of the year I feel completely comfortable eating as I choose. This year, I made some Prosciutto, Tomato and Feta Pies with Basil and Zucchini for breakfast and they were delicious. Please note how dark it was outside when we were dragged from our beds for present opening. Being Summer here, that darkness would make it about 5am. I went very low key on presents this year. Happily no one seemed to notice. I have big travel plans, so I would rather put the money into that fund. 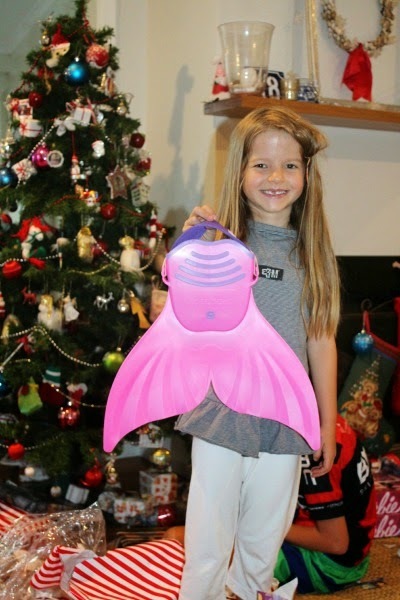 This little girl takes total joy in all life has to offer and she reckoned it was her best Christmas yet. 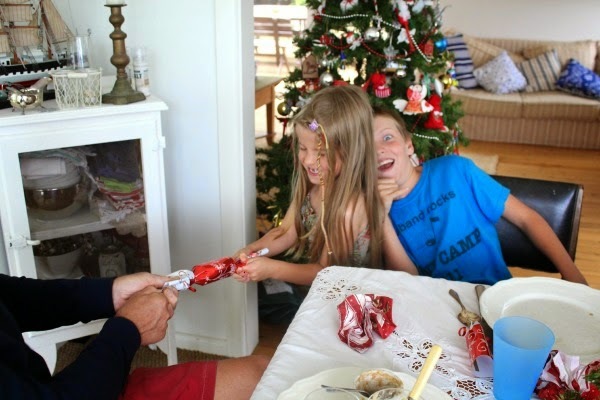 Having one believer left in the family still makes Christmas very magical, as seen through her eyes. Bingo!!!!! Especially when the big guy in red, brings exactly what you asked for. 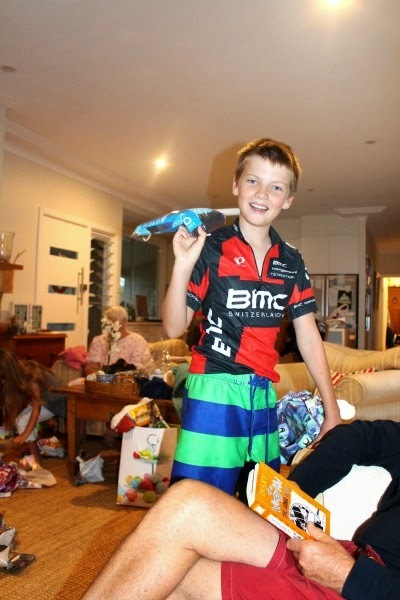 My big boy was just overjoyed to become the proud owner of a BMC racing bike shirt. I always put on a special dinner, just for my immediate family on Christmas Eve. It's hard to believe my mum was looking so well and happy after a major operation 7 weeks ago. I hope I take after her. Her attitude to life is pretty inspirational. Mum made the prawn cocktail sauce, to go with my spider like prawn cocktails. The recipe for which, I will share later. 12 wide slices of prosciutto cut in half length ways. You can also use 2 packets of the Serrano Ham from Aldi. Spray a 12 150ml capacity muffin pan with oil. Whisk 12 eggs in a large jug. Mix in chives and season with salt and pepper to taste. Divide the egg mixture between the 12 muffin pans. Top with tomatoes and zucchini. Bake for 25-30 minutes, or until the egg is just set. Remove from the oven and allow to sit for 10 minutes to cool slightly. Run a sharp knife around the inside edge of the pans to help remove the pies. 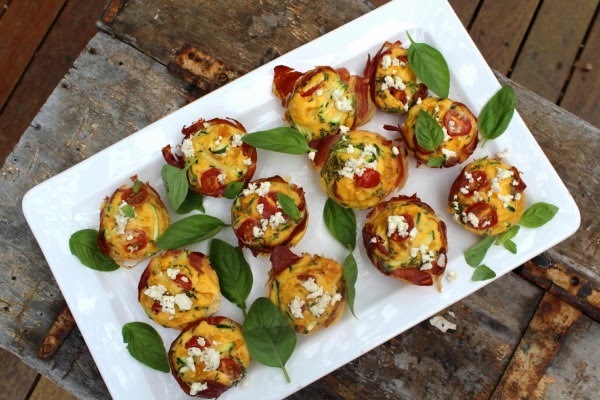 Arrange on a serving plate and top with feta cheese and basil. These were pretty simple and very well received. 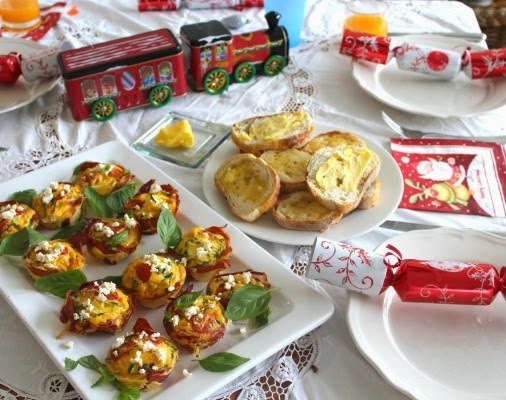 I just served them with buttered toast and we had a simple, yet very yummy Christmas Day breakfast. 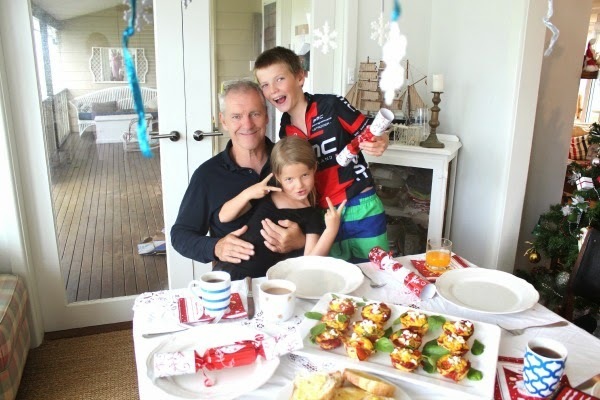 For more simple family friendly recipes, have a look at my recipe page here. If you would like Desire Empire posts to come straight to your inbox, you can sign up here for my Newsletter. OMG! 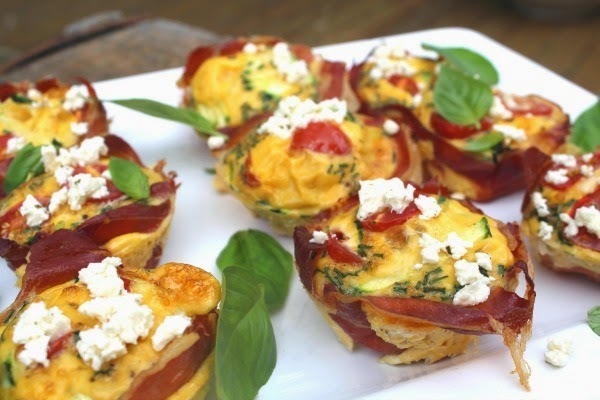 My son is just getting up from his nap and I want to take him and rush out and go get all the ingredients for these. YUM!!! These look delicious, great combination of flavours., Your girl is so brave, 60 people is a lot, especially when you are 6. Great shots. Layne will have to put on a show for us. She has a month to get it down. These muffin type pies look great and I will try them!AriadnefromGreece! 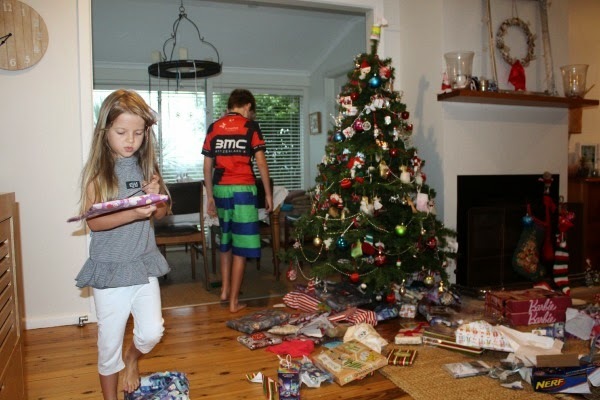 Ever since our kids were little we have had a 6.30am rule in our house for both Christmas and birthdays; anyone who is up prior to this has to wait quietly until the appointed time and only then are they allowed to wake others. The 27 year old who usually wakes us all at 6.30am on Christmas morning "graciously" let us sleep in until 8am this Christmas on the proviso that one of his sisters make pancakes for breakfast on Boxing Day! I do love that they still get a real buzz out of Christmas though. By the way I don't envy anyone going in a competition against your adorable little girl; she is seriously cute. That's sweet on both counts Julie Thanks. Yum! We won't lowkey on pressies this year too. Sometimes we just need to put things in perspective and remember what Christmas is really all about.